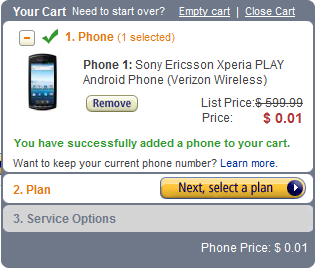 This is quite the deal if you've been thinking about getting an Xperia PLAY: with a new two-year agreement, you can get the one-and-only Playstation phone for less than one dollar at both Amazon and Wirefly - $0.01 and $0.99 respectively, to be exact. 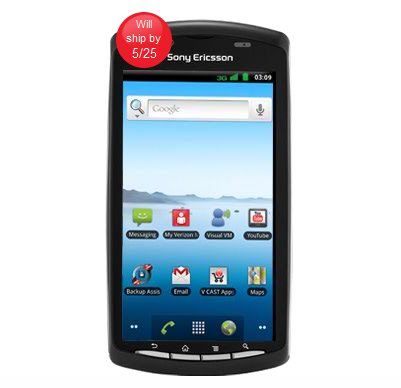 If you're already on VZW, you can still score this device for $50 with a two-year agreement renewal. 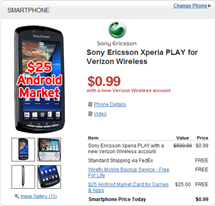 Even though both retailers are offering similar deals, if you decide to buy from Wirefly, you'll get a $25 Android Market Card good towards to purchase of new apps and games, which makes this an overall better deal (if you like free stuff, that is). 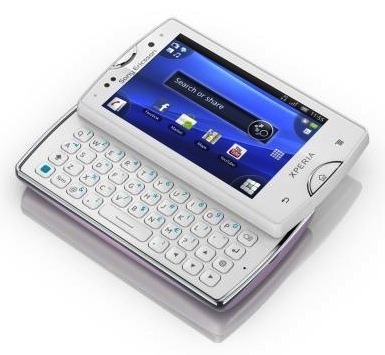 If you're the proud owner of the recently released Xperia PLAY, then you'll probably welcome what Sony Ericsson announced today via its product blog: the Xperia PLAY Experience Pack. Sounds pretty intense, right? 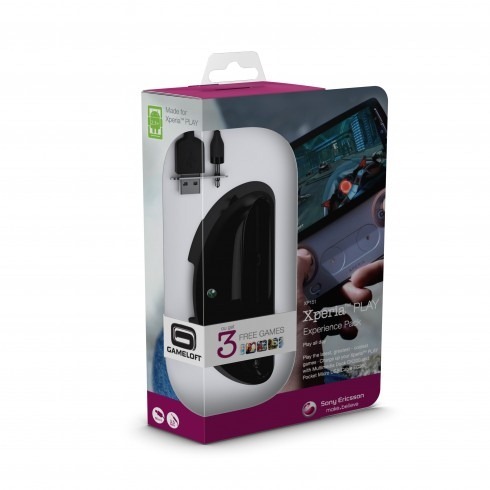 The contents: a multimedia dock, pocket USB cable, "music cable to connect the dock to your audio system," and three free games from Gameloft. Ah, that last part got your attention, yes? Before I drop the list of games that you can choose from, lets talk about the multimedia dock for a second. 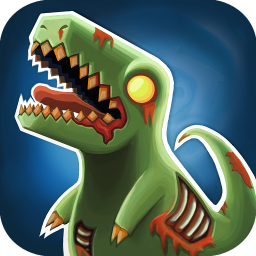 Roughly two months ago, Halfbrick - the company behind the infuriatingly addictive Fruit Ninja - released its latest and seemingly greatest Android game: Age of Zombies. 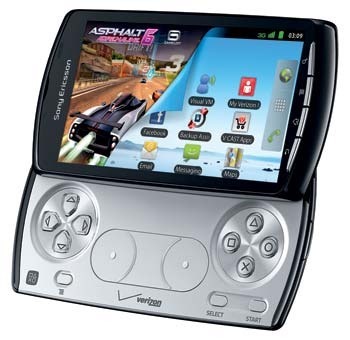 The otherwise praiseworthy game had one major flaw, however - it was only available for Sony Ericsson's Xperia PLAY, which at the time wasn't widely available. This resulted in understandable disappointment and displeasure in the Android gaming community - our own Artem Russakovskii used the weekly app roundup to publicly express his desire to play (no pun intended) the game. 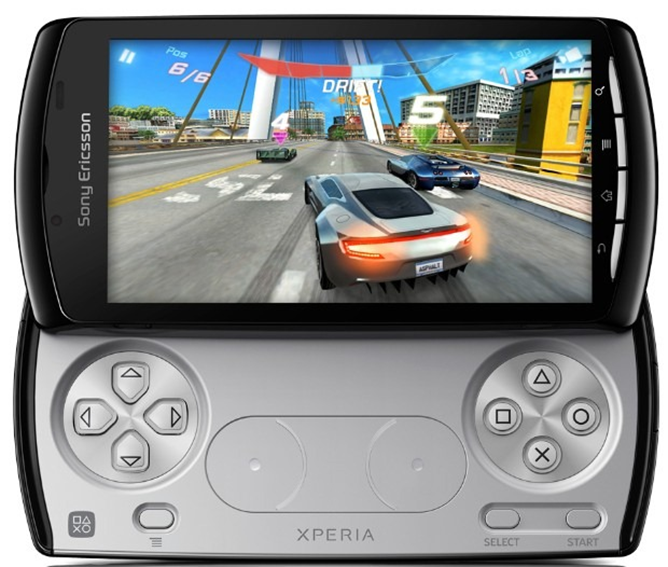 [Hands-On and Initial Review] Xperia Play: The PlayStation Phone Hits The U.S. 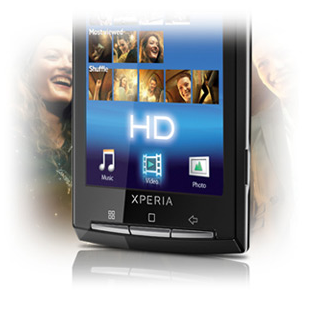 Note: Most of the pictures in this hands-on were taken by a second Xperia Play unit, so you can use those to judge the quality of the camera. 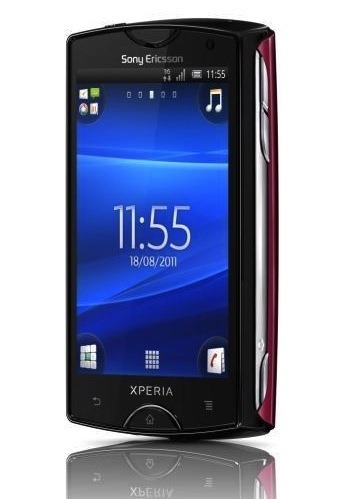 The saga of the PlayStation phone has been a long one, but we finally have the device in our hands. 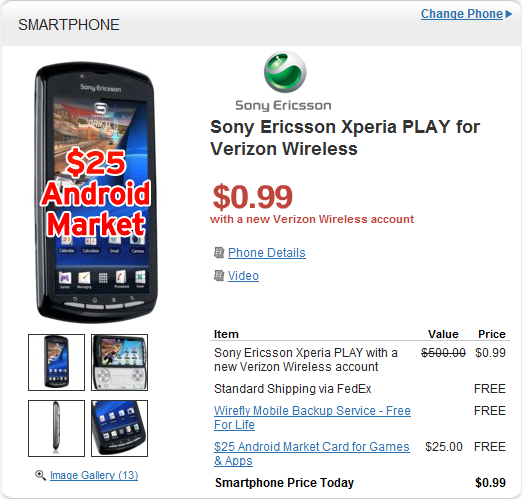 Some I/O attendees received their own, but now Verizon customers can get the device for themselves. A full review will be available in the coming days, but for now, here are my initial thoughts on the Xperia Play. 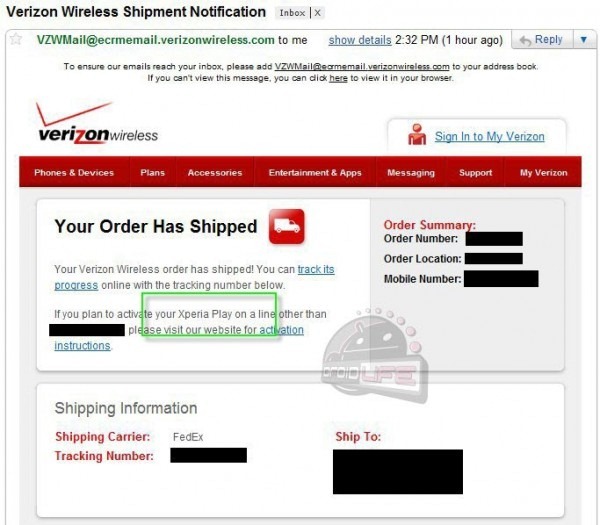 Looks like Verizon isn't waiting until May 25th to ship the Xperia Play - at least a few customers have received confirmation that their phones have already been mailed. 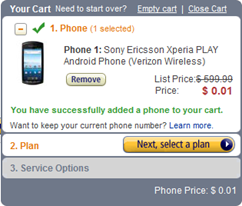 Of course, it's possible - likely, even - that not all pre-ordered Xperia Plays have been shipped yet. Like clockwork, the thumb-hungry Xperia Play from Sony Ericsson went up on VZW's site, ready for some early pre-order action. 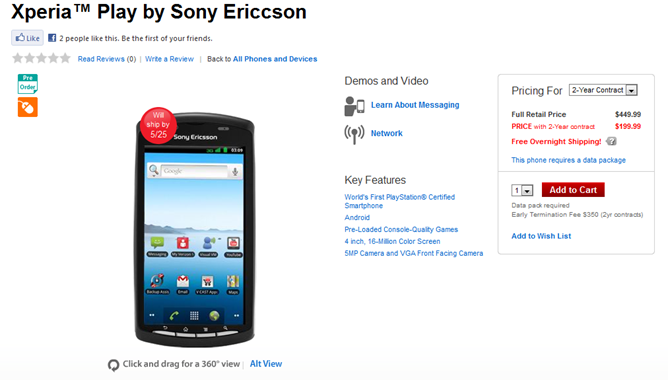 It will set you back $199.99 on a 2-year contract and should ship out May 25th to be in your hands by May 26th, all for free. 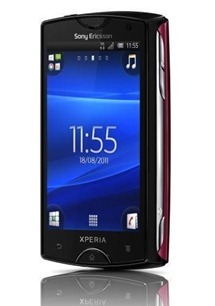 This Android 2.3 "Gingerbread" phone features a 4" screen, slide-out PlayStation-style controls, a 1GHz single-core Snapdragon processor with Adreno 205 GPU, a 5MP rear and VGA front camera, and comes with a bunch of games pre-installed: Madden NFL 11, Bruce Lee Dragon Warrior, Asphalt 6: Adrenaline, The Sims 3, Star Battalion, Crash Bandicoot, and Tetris. This is huge. Like, massively huge. Probably the best thing to come out of Google I/O so far this morning huge. I'm talking about the Android Alliance and the solution to a problem that has plagued Android users since the beginning of time (okay, maybe not that long). The Android Alliance is a special task force dedicated to delivering Android updates quickly and efficiently to all devices for 18 months after they're released. While the pair may not be the hottest thing to hit the streets lately, they definitely have the whole smallest-HD-smartphone thing going for them. Once again, we find that the selection of Android phones available to those in Canada is increasing both in size and quality. 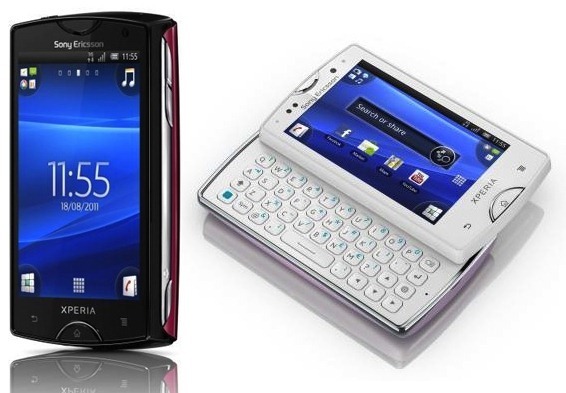 The next two additions to that ever-growing range of devices available in the Great White North are to be the Sony Ericsson Xperia PLAY and arc. According to a press release from Best Buy Canada, as of April 28th, these two great new handsets will be available on Rogers.